The event, held at Dawlish Methodist Church, saw hundreds of people attend over the course of three hours, in which representatives from Network Rail along with world-leading engineers in coastal, tunnel, cliff and railway engineering provided an update on the detailed studies that they have been conducted, and continue to undertake, along the railway line between Teignmouth and Dawlish. These studies are helping to determine what is happening to the cliffs and coastline so long-term solutions can be considered. These options will help to protect this vital rail artery, which serves communities and businesses in South Devon and Cornwall, and connects the region to the rest of the UK. During the session, plans to repair and enhance four breakwaters at Dawlish, announced on 29 October, were outlined in detail as well as potential work to strengthen the Dawlish sea wall. Julie Gregory. senior commercial scheme sponsor on the project for Network Rail, said: “It was great to see and engage with so many residents from Dawlish and the local area. We hope many of their questions have been answered, giving a better understanding of the scale of process that we are undertaking. “This iconic stretch of railway is an important part of the community and wider South West region, and so we are working closely with the Environment Agency, Marine Management Organisation, Teignbridge District Council and Department for Transport. As part of this process we are undertaking and analysing extensive geological, marine and environmental studies to identify the most effective engineering solutions to protect the line. Such is the scale and importance of the challenge that Network Rail has established a dedicated South West Rail Resilience Programme to identify and implement the best options to help improve the resilience of this iconic stretch of railway. The aim of the programme is to protect against a repetition of the events of 2014 when the line was closed for eight weeks after extreme weather washed away the seawall and a massive landslide blocked the railway with 20,000 tonnes of material. The damage caused by the extreme weather in 2014 cost £50m to repair and caused significant disruption to residents up and down the line, visitors and businesses that use and rely on the line. Longer-term options for making the railway more resilient in this region will be presented to the public, local councils and government in spring/summer 2019 once analysis of the engineering studies has been completed. 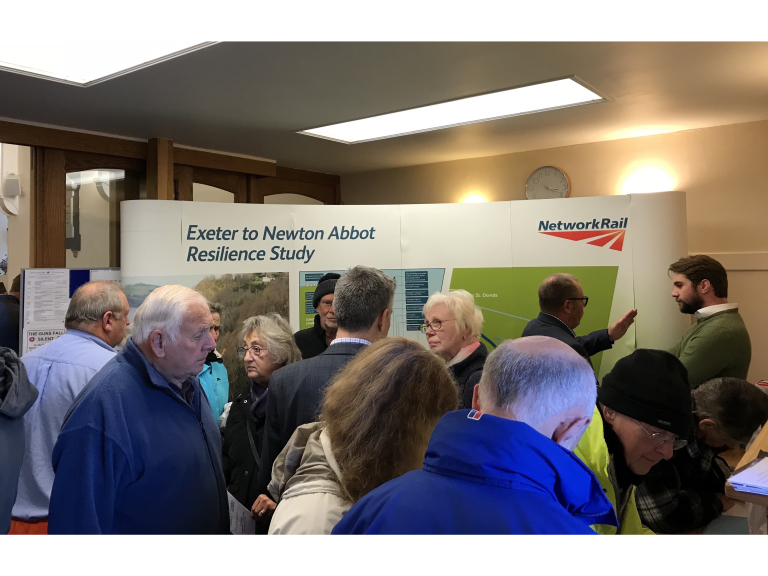 In response to feedback at the Dawlish drop-in last week additional information on some of the possible options will be shown at the Teignmouth and Holcombe events. More information about the South West Rail Resilience Programme can be found at @SouthWestRRP on Twitter or Facebook.